All our ovens are 100% insulated with ROCKWOOL (look thevideo) and guaranteed against cracks that’s why your oven will be delivered with our special product (Ultrafire). 90% of the ovens on the market make cracks, after the first uses, we are the only owning this product in the market with such amazing characteristics. 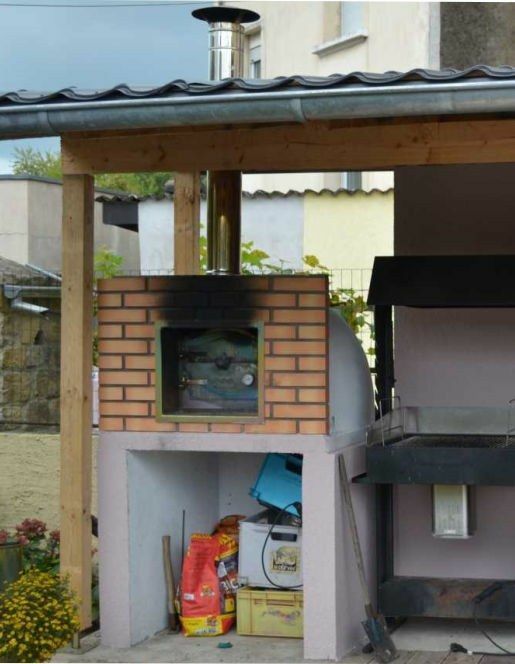 -The dome of this wood fired oven is a kind of Igloo type, this model is designed for all kinds of dishes:Pizzas, bread, roasts, cooked dishes, grills, and others. A great option Mediterranean Wood fired Pizza Oven - ALGARVE 90cm! Free shipping to England, metropolitan France*, Monaco, Belgium, Luxembourg, Italy and Spain. For other destinations please contact us. Ingredients below are enough for two people. Pre cook mincemeat filling of your choice. Add mincemeat down the centre of the dough and sprinkle with cheese. Fold in the sides, bit like a Cornish pasty, and pinch the top together and pat the top flat. Now you have a long thin log. 50cm long 10 cm wide and 5 to 10 cm deep. Cook in hot oven for approximately 4 minutes. Attractive , Black covers to Protect your oven from the elements all year round. Made from Heavy duty Polyester with PVC backing this will keep your oven in excellent condition all year! !